The relationship between Weddings and Bollywood dates back to when Salman Khan fell crazily in love with Madhuri Dixit in Hum Aapke Hai Kaun and had us aww-ing to no extent! And while we’ve all grown up watching Raveena Tandon sizzle in those chiffon sarees, Shahrukh Khan sealing his title of “King of Romance” and Amitabh Bachchan evolving as an Angry Young Man. 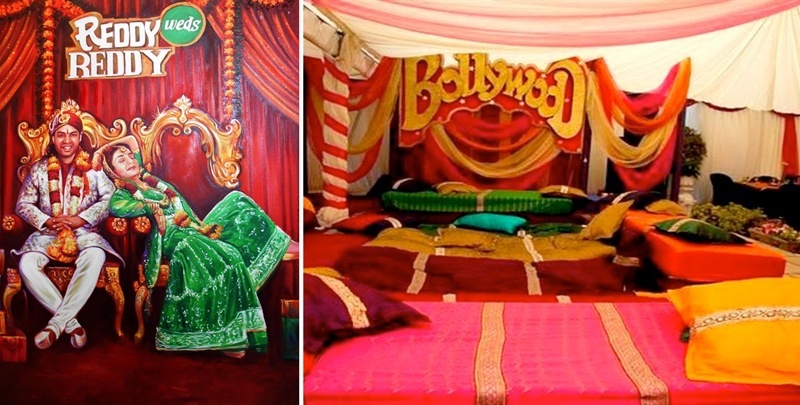 Bollywood has always been part and parcel of our everyday lives, so why not make it a part of your wedding décor too! Level up with some ardent fan-like Bollywood wedding decor at the most special day of your life, now what could be a better deal than that?! We show you how to do it with everything, from sign boards, invites, favours, bollywood style stage decor, and wait till you find out more because, picture abhi baaki hai mere doston! Both of you fight over whether which Khan rules the industry? Get this decor to reflect these little joys of your relationships that your guests will remember forever. Ideal for a sangeet or cocktail – these cushions to cozy up to, and this wedding décor to make all of your guests instagram all night long!